Bank notes: 1000, 2000 (very rare), 5000, 10000 yen. Climate: Average temperature in September: 23 degrees C.
visitor". Otherwise, you need to obtain a visa before entering the country. Temporary visitors from most countries are allowed to stay for up to 90 days. other service providers are required to include the consumption tax in the prices shown. Tipping: Basically, it is not a custom to give tips, except in high class ryokan (traditional Japanese inn). 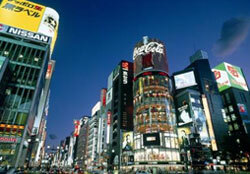 Tokyo, a sprawling metropolis with a population of nearly 13 million people, is one of the world’s great cities. Originally a small castle town in the 16th century, by the 18th century it was the centre of the Shogun’s power and already one of the largest cities in the world. 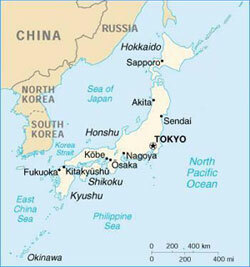 Since the middle of the 19th century, it has been the capital and the financial and cultural hub of modern Japan. With this history behind it, Tokyo today is a fascinating blend of the traditional, the modern and the hyper-modern, a fascinating blend of East and West, and yet at the same time a uniquely Japanese city. Tokyo really is a place that has something for everyone – a place traditional temples and shrines stand cheek by jowl with towering skyscrapers, and small traditional bars and shops can be found just behind some of the most exciting and innovative architecture to be found anywhere in the globe. With its super-efficient transport system and its extremely low rates of crime, Tokyo is a city where one can enjoy the best that the world can offer, whether it is in terms of art and culture, cuisine, the latest hi-tech gadgetry, financial wizardry, or human warmth and friendliness. Whatever your interests, Tokyo can offer you an experience that you will never forget. Please reserve your seat at the Accompanying Persons’ Tour Desk located next to the Reception Desk. Seats are provided on a first come first served basis. Please ask the Desk staff for details. Tours will be operated for the Congress period. Details will be made available when contents are finalized. The current Imperial Palace (Kokyo) is located on the former site of Edo Castle, a large park area surrounded by moats and massive stone walls in the center of Tokyo, a short walk from Tokyo Station. It is the residence of Japan's Imperial Family. The Imperial Palace East Gardens are open to the public throughout the year except on Mondays, Fridays and special occasions. Asakusa is the center of Tokyo's “shitamachi”, lit. "low city", one of the districts of Tokyo which have preserved a certain atmosphere of the old city. 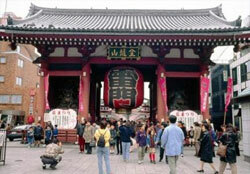 Asakusa‘s main attraction is Sensoji, a very popular Buddhist temple, built in the 7th century. The temple is approached via the Nakamise, a shopping street that has been providing temple visitors with a variety of traditional, local snacks and tourist souvenirs for centuries. Shinjuku is one of the 23 wards of Tokyo, but the name commonly refers just to the large entertainment, business and shopping area around Shinjuku Station. Handling more than two million passengers each day, Shinjuku Station is Japan‘s busiest railway station, served by six railway companies and about a dozen railway and subway lines, including the JR Yamanote Line. The 243 meter tall twin towers and surrounding buildings contain the offices and the assembly hall of the metropolitan government of Tokyo, as well as observatories on the 45th floor of each tower. The view from the southern tower is considered the best. Open daily 9:30 to 23:00 (south observatory until 17:30), except December 29-31, January 2-3 and occasional inspection days. Furthermore, the north observatory is closed on the 2nd and 4th Monday and the south observatory on the 1st and 3rd Tuesday of each month, except if a public holiday falls on the closure day, in which case the observatory is closed the following day. Admission is free. Shinjuku Gyoen is one of Tokyo's largest and most pleasant parks and best cherry blossom viewing spots. It was opened to the public in 1949, after it had served as a garden for the Imperial Family since 1903. Open from 9:00 to 16:30. Closed on Mondays (Tuesday if Monday is a national holiday) from December 29 to January 3. There are no closure days during the cherry blossom season (late March to late April) and the Chrysanthemum Exhibition (first half of November). Admission is 200 Yen. Access: 5 minutes' walk from JR Ueno Station. Access: 1 minutes'. walk from JR Ueno Station. Admission Fee: Varies according to the exhibition. Hakone is part of the Fuji-Hakone-Izu National Park, less than 100 kilometers from Tokyo. 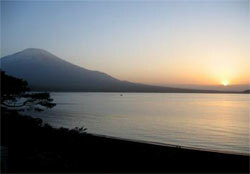 Famous for hot springs, outdoor activities, natural beauty and the view of nearby Mt. Fuji, Hakone is one of the most popular destinations among Japanese and international tourists looking for a break from Tokyo. Mt. Fuji, at a height of 3776 meters, is the highest mountain in Japan. It is not surprising that the nearly perfectly shaped volcano has been worshipped as a sacred mountain and loved by both artists and common people. 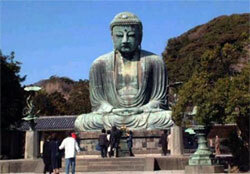 Kamakura is a very popular tourist destination. 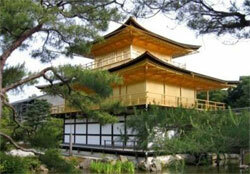 Sometimes called the Kyoto of Eastern Japan, Kamakura offers numerous temples, shrines and other historical monuments. In addition, Kamakura's sand beaches attract large crowds during the summer months. Nikko is a small city at the entrance to Nikko National Park. It is most famous for the Toshogu, Japan's most lavishly decorated shrine complex and mausoleum of Tokugawa Ieyasu, the founder of the Tokugawa shogunate. Nikko has been a center of Shinto and Buddhist mountain worship for many centuries, and Nikko National Park continues to offer scenic, mountainous landscapes, lakes, waterfalls, hot springs, wild monkeys and hiking trails. Nara is located in the Kinai plain, less than one hour from Kyoto and Osaka. 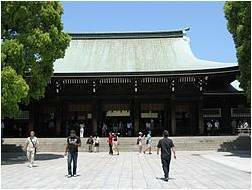 Due to its past as the first permanent capital, it remains full of historic treasures, including some of Japan's oldest Buddhist temples. Taxi fares typically start around 650-750 yen for the first two kilometers and increase by roughly 90 yen for every additional 288 meters traveled. The cost also increases when the taxi is not moving for a prolonged time. Late in the evening, rates are raised by 20-30 percent. A plate on the dashboard in the lower corner of the windshield indicates whether a taxi is vacant or not. A red plate indicates that the taxi is vacant, while a green plate indicates the opposite. During the night a light on the roof of a taxi can indicate that the taxi is vacant. 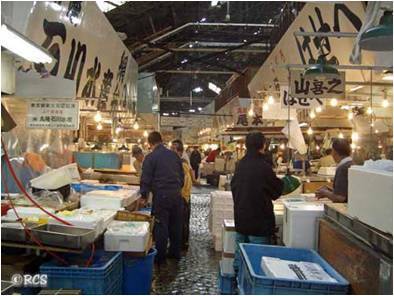 If you do not speak Japanese, or your destination is not a well known place, it is recommended that you give your driver the precise address of your destination on a piece of paper or, even better, point it out on a map, since the Japanese address system can be confusing even to local taxi drivers. Japanese cuisine offers a great variety of dishes and regional specialties. Some of the most popular Japanese and Japanized dishes are listed below. Sushi is a Japanese dish consisting of cooked vinegared rice which is commonly topped with other ingredients, such as raw fish or other seafood. Tempura is seafood, vegetables, mushrooms and other pieces of food coated with tempura batter and deep fried. Tempura was introduced to Japan by the Portuguese in the 16th century, but has become one of Japan's most famous dishes internationally. A nabe dish prepared with thinly sliced meat, vegetables, mushrooms, tofu and shirataki (konyaku noodles). The pieces of food are dipped into a raw egg before eaten. Shabu-shabu is Japanese style meat fondue. Thinly sliced meat, along with vegetables, mushrooms and tofu is dipped into a hot soup and then into ponzu vinegar or a sesame sauce before being eaten. Soba noodles are native Japanese noodles made of buckwheat flour or a mixture of buckwheat and wheat flour. Soba are about as thick as spaghetti. They can be served cold or hot and with various toppings. Ramen are Chinese style noodles prepared in a soup with various toppings. Ramen is one of the many popular dishes that were originally introduced from China but have become completely Japanized over time. Yakitori are grilled chicken pieces on skewers. Most parts of the chicken can be used for yakitori.